Well, first it's important to say that this is the first time I've ever been at a concert where the singer could actually hear me cheer. 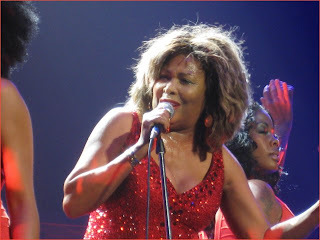 So knowing that Tina always puts on a better show when she knows the audience is into her and enjoying the show I was really happy to see that the crowd was responding to her. Well, this was the crowd to do it in. Ok, so the traffic was a nightmare and we actually got there about ten minutes before Tina went on! So far it seems Tina consistently goes on from 8-9, takes a half hour break, and then 9:30-11ish. 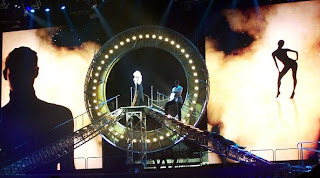 So the music started pumping, the curtain opened and there was the queen high up on that platform where she belongs. She stuck out her hand, the guitars started jamming, and the crowd went wild! There were groups of people on the floor that stood up the whole time. The people behind us on the floor did yell at us to sit down once but I'm sorry.....we paid $168 for each of these floor tickets and we were going to give Tina our all. My feeling is that if you want to sit down for a concert you probably shouldn't buy tickets on the floor. So the curtain began to open and She broke out into Steamy Windows and everybody was just cheering her on like crazy. There were times (unfortunately I can't remember which song) that she actually had to wait a while before going on to the next number because the crowd just kept cheering and cheering. You could tell she looked a little surprised. Ok, so onto the crack up part. 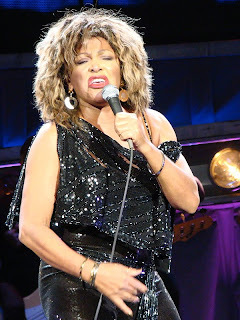 I don't know why this never occurred to me before but when Tina was singing Private Dancer she got to the line, "Do you want to see me do the shimmy again?" and I screamed "YES!" Oh my gosh the people around me started dying laughing and Tina actually turned away from the audience for a second because she was cracking up. At that point I realized "Oh my god, she can actually hear me!" Later on during "What's Love" when it was time for the men to sing she asked if there were any men out there and I guess she wasn't very pleased with the initial response. I wasn't sure exactly what she said but then she said, "I'm wondering about the men....." and the guy in front of me did some of those dog bark sounds that Arsenio Hall used to do back in the day and Tina started cracking up again! You could tell she was really enjoying it. During Simply The Best everyone was up cheering and singing and directly behind me were these two beautiful elderly black women dressed to the nine's and at the end of the song I turned around and gave both of them a high 5. You could tell they were really surprised but they were also smiling and got a big kick out of it. 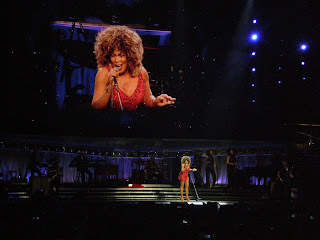 Then during Proud Mary I would echo some of the things she was saying. She asked "Do you know why?" and I screamed, "TELL US WHY, TINA!" and she started laughing again. Then I did the Elton thing with her and the guy in front of me joined in. "We're going to take the beginning of this song and do it....easy. And then.....(and then)....And then...(and then).....AND THEN.....(and then....) and Tina turned around again because she was laughing. I was glad that she enjoyed it so much because for a minute I was worried that she might think it was kind of annoying. As soon as she started singing the slow part THE WHOLE ARENA started singing with her. That was amazing to hear that many people singing at the same time. A few other interesting parts of the show.....first off - she wore the black outfit for the sitdown songs. Don't know where the silver was. Secondly, when she was introducing the ninjas each one of them just did a tiny bow and she said, "Ok, that's nice, very nice now." and was smiling like there was an inside joke. 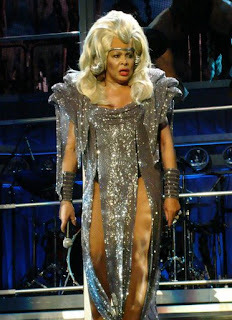 I think she didn't know they were going to be so subtle and I remember during the LA show that when she introduced each one of them they did a bunch of flips and stuff across the stage and she said, "ok, ok, fellas, this is only the fifth show, you'd better save some of it...." The next interesting thing happened during Nutbush. She was on the arm and it was the part where she sort of dances down the arm and then back to the end again. Well, she was down by the stage and started dancing her way back to the end and some guy threw a single long stem rose and it landed on the arm and then she danced right over the stem. My wife and I both kind of gasped because it really looked like she could trip over it. (I have this on video!) She didn't trip over it but when the arm finally lowered back down and set itself back into the stage she walked over and picked it up after the song ended. She smelled it and looked out to the audience lovingly. She said, "I want you to know that I've played Detroit many many times over the years but when I leave tonight I am going to remember that you all were absolutely fantastic!" And she lovingly looked down at the rose for a second, looked back at us, and blew us a kiss. It was so awesome and really kind of theatrical, too. Then she started into Be Tender and my wife noticed first that she was teary eyed again. This definitely didn't happen during the LA show. After the show we visited for just a few minutes with the people around us and I thanked them for being so much fun during the show. I can't believe what a difference that makes. Other tidbits - Stacey Campbell was there with Lisa Fisher and they were a much better combo than the other back up singer. The guy in front of me said that Cher's show is on hiatus for a few months which is why Stacey was able to get back with Tina. Stacey did the last part of Better Be Good and Lisa Fisher tore it up at the end of It's only Rock N Roll. She sang out to the audience, "If you like it say yeah, if you like it say, yeah." The only problem was I'm not sure if the crowd could really what she was singing enough to really respond. But she looks fantastic (lost a little weight) and sounded awesome. Oh my gosh what a fantastic memory! I traded emails with the people around me so we can share pics etc. As we left I called my mom (who was watching our kids) and my dad (by himself in Texas since Mom was in Ohio) to tell them about cracking Tina up. I don't know why it never occurred to me to scream YES after the "shimmy" line but it's perfect - it's a quiet moment and OF COURSE WE WANT TO SEE TINA DO THE SHIMMY! HA! As far as the video goes - I was able to bring in the camera. There were no metal detectors but they were checking women's purses only. So I walked right in no problem and I didn't see them give anyone with a camera an issue. However, unfortunately my camera will only record 1 minute of video and then stops and you have to hit start again. I didn't find this out until she'd been singing Steamy Windows for a full minute. So I did get about 40 minutes of video and while I haven't seen it on TV yet (we're staying in Michigan a couple of days before coming back to Ohio) - my wife and I did watch a lot of it on the little digital camera and it looks pretty good. So it's a wonderful souvenir but definitely not an actual bootleg or anything. Oh well. In some ways I was kind of glad because although I really wanted a video of the show I also couldn't dance and scream if I was trying to record. So when I get home and get it on the computer of course I'll be very happy to share with everyone. Well, thanks for reading this super long post and I hope you enjoyed it as much as I enjoyed reliving it. LONG LIVE THE QUEEN!!!!!!! 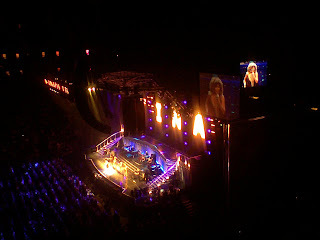 Thank You, Tina, for an absolutely amazing concert in Toronto. Your voice was as clear and powerful as your recordings. You looked fabulous! Toned and svelte, your dance moves really excited the crowd. 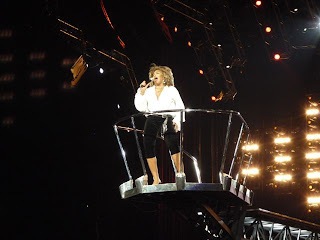 I especially liked the silvery outfit from "Jumpin Jack Flash" Your hair style was my favorite of all; many times it seemed as though this was the 1984 Private Dancer Tour, only better. Your band was right on with great music, without overpowerring your vocals. 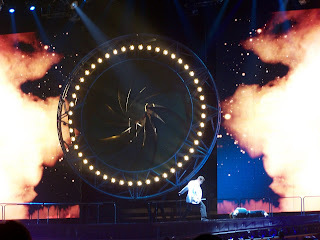 The lavish sets and pyrotechnics made this a once in a lifetime performance! Your dancers looked great with their precision, synchronization, and the way they complimented you. There were only three that night (Solange, Claire, and I think, Djeneba), but actually I think three looked great! It was so exciting each time you danced. I really enjoyed your edgy dance moves with your guitarists in "Better Be Good To Me, as well as when you danced with your backup singer, shimmied across the floor with your dancers in "The Best, " and of course all the dancing in "Proud Mary" and "Nutbush" You really reach out to the audience; they feel the connection and genuineness in your comments between songs. The Ninjas had some entertaining moves, and I enjoyed the intermission. 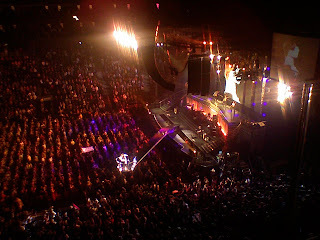 The guy next to me was 22 years old and had flown from Brazil to Canada just to see you in concert! 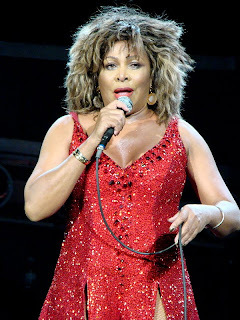 Tina, you sang more songs than most performers , but you just have so many great songs to choose from. I'd love to hear "Paradise Is Here," "Silent Wings," "Back Where You Started," "Hold On ,I'm Coming," "Foreign Affair," "Show some Respect," and many more. And You Know Why? 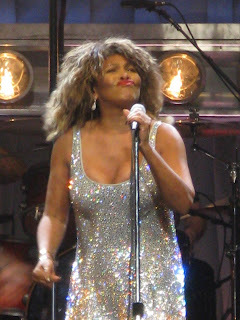 Because ,Tina, you are simply the greatest entertainer; this concert is undispured proof that you are the queen. Just got back from my hometown show here in Michigan at the Palace. 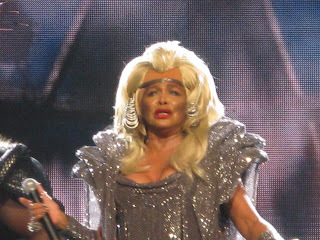 Tina was the best I've seen her all tour, not one error that I could tell happened at this show, no words forgotten, no curtain issues, etc. 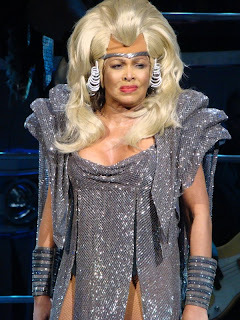 I sat 2nd row almost center and managed to work my way to front row after the folks in front of me left early for Nutbush. I was really disappointed in that she smiled at me to grab the rose I had bought her and the venue's old security man just about pounced on me preventing me to give it to her (bunch of jerks). Other than that, the show was a night to remember and the last one of my travels after 4 shows in the U.S. so everyone enjoy yourselves and keep me posted. Thank you Elle my mom enjoyed the fanclub tickets in 5th row center. It was great. What a wonderful night!!! 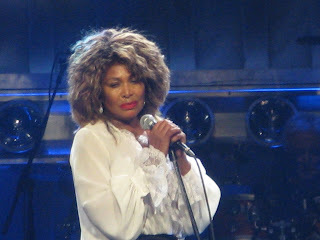 Tina was again, on all cylinders and Iwas able to get pictures plus the entire video of "Be Tender". I'm in the airport, on my way home, but will send the link as soon as I can after I get home. The crowd pretty much stayed on their feet and it was easy to tell that Tina loved the love that was being given to her. The only 'mishap' that I caught was when Claire stepped on Tina's foot when they were doing Nutush (I'm pretty sure that was the song - it was towards the end). 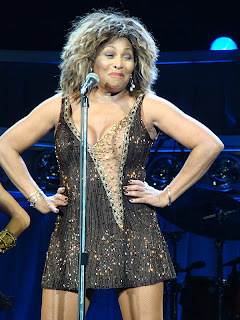 Tina gave her the same look she gave Beyonce when she stepped on Tina's foot at the Grammy's. Claire just grinned (not much she could do - sure couldn't stop dancing and say 'are you alright?? LOL) and Tina forged on as usual. I'll send the pictures later on - or at least a link to them. 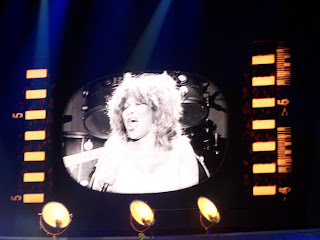 I was on the 3rd row and even though security said "no pictures", as soon as Tina started singing I think they got so involved w/ the show they didn't care!! Our winner for the photo contest for the month October is Deb Collette. Her photo was posted 10/04/2008 - 07.44:00 pm. Kansas City October 1, 2008. Congratulations Deb. Please e-mail us with your address so we can mail you the latest CD called, TINA!